ABI Research reports that forked Android or AOSP smartphones grew 20% sequentially from 1Q 2014 to 2Q 2014 (total market growth was 3% sequentially) and also accounted for 20% of the smartphone market. Certified or OHA Android still leads the market with 65%, but it grew 13% sequentially. 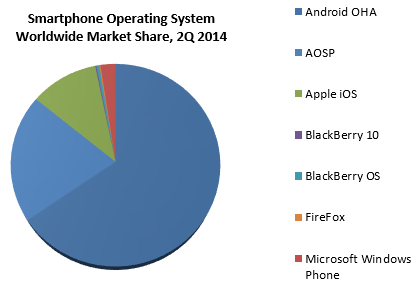 Android AOSP and OHA combined shipped 278 million smartphones, a staggering 86% share, in 2Q 2014. “AOSP’s growth is driven by the development of Chinese and Indian handset manufacturers, not only in their domestic markets, but increasingly throughout Asia and beyond,” said Nick Spencer, senior practice director, mobile devices, ABI Research. “Chinese and Indian vendors accounted for the majority of smartphone shipments for the first time with 51% share. While many of these manufacturers are low cost, some are making inroads in the mid-tier, including Xiaomi and Gionee, hence the growing challenge to Samsung in particular,” added Spencer. The scraps remaining for third or fourth place (if you include AOSP) place are few and far between with third placed Microsoft Windows Phone experiencing a near flat quarter with -1% growth year-on-year and a share of 2%.